In many aspects, Brothers is a very original game. 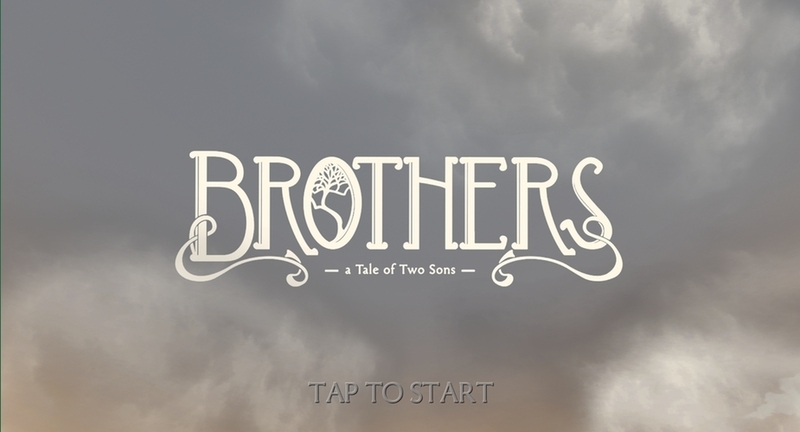 It is a tale in which one leads the title characters - two brothers - through a dangerous world. After the brothers lost their mother through drowning, they face losing their father, who can be saved only by the water from a Tree of Life that grows - as it often turns out in fairy tales - over the hills and far away. The brothers - younger Naiee and older Naia - set off on a dangerous journey through towns, villages, mountains and caves in which the stake is not only the life of their father, but their own lives. On their way they meet other people and creatures, and have to cooperate with them, fight them, or avoid them. While traveling through the mountains they are helped by a mountain giant (who looks more or less like a troll) whose giant wife was kidnapped and jailed deep in the stone labyrinth of a town hidden under the mountains. For those familiar with Tolkien's "Lord of the Rings, the town resembles "Moria" -- the kingdom of the dwarves. In my opinion, the associations with the world created by Tolkien are not coincidental. The two brothers set off on a journey very similar to that of Frodo Baggins and Samwise Gamgee. The surrounding land is also very Middle Earth-like: small towns and villages with wooden architecture, castles, mountains, valleys and rushing rivers. I mentioned that the brothers have to fight, but in this game there is not much true fighting. There are some interactions that can be regarded as fighting, like scaring wolves away with a burning torch. The success of the two brothers' mission depends mostly on cooperation, especially on the cooperation of the brothers. Each of the brothers has special abilities that the other lacks. Those abilities are not only useful but crucial. The younger, smaller brother can squeeze through bars on gates, and thanks to that ability he can reach switches that open the path for the older brother. Naia is larger and much stronger, so he can move much bigger levers that are beyond the capability of his younger brother. He can also swim, while the younger brother Naiee is afraid of water as he witnessed their mother's drownIng. Sometimes both brothers have to toil away turning cranks to move some machinery to get access further down the path. Sometimes the older brother helps the younger to reach a ladder, and in some cases the life of the younger brother is literally hanging in the balance in the hands of the older. A very original touch is the independent control of each brother using two screen pads, typical of those used in games based on the Unity engine. You can place them on the screen in a location that is best suited for your thumbs. This way of controlling the brothers requires some training as it is easy to control one character with a thumb, but controlling two brothers with two thumbs is much more difficult. There are no other buttons on the screen. Both pads also work as interaction triggers, letting each brother pick up or throw objects, or talk to independent characters. Both the brothers and the other characters use their own language. It is hard to say if it is as complex as the languages created by J.R.R. Tolkien. The language used in this game is based mostly on the Lebanese dialect of Arabic. That's not a surprise - the director of this game is Josef Fares, who is originally from Lebanon. During the entire game the player listens to dialogues that aren't translated in any way. There is no problem with that and there is no need to have different language versions of the game -- it is easy to understand what's going on thanks to the body language of the characters and the context of each conversation. Unfortunately, there aren't many dialogues in the game, nor additional tasks or deeper interaction with the independent characters the brothers meet. Sometimes I got the impression that the world that the brothers travel through is both beautiful and empty at the same time, as in the playable demo of Unreal Engine - "Epic Citadel" - that was released five years ago. The rare additional tasks in the game can make one shed a tear, as when the brothers release the mountain giant's wife or when they rescue a man, preventing him from hanging himself after his entire family died in a fire. Associations with "Epic Citadel" come from the beautiful 3D graphics generated by the Unreal engine. Everything looks gorgeous, from town houses and castles to the trees, mountains and rivers. Apart from the interesting plot, the graphics alone make this game worth buying and exploring.